Hot water is an essential necessity so if you are looking to replace an old water heater then you’ve come to the right place. We take a look at all the factors to consider when installing a water heater and how to ensure you’re getting the best option for your needs. If you’ve experienced any of the following situations, it’s time for a new water heater installation before the problem gets worse, and results in flooding. 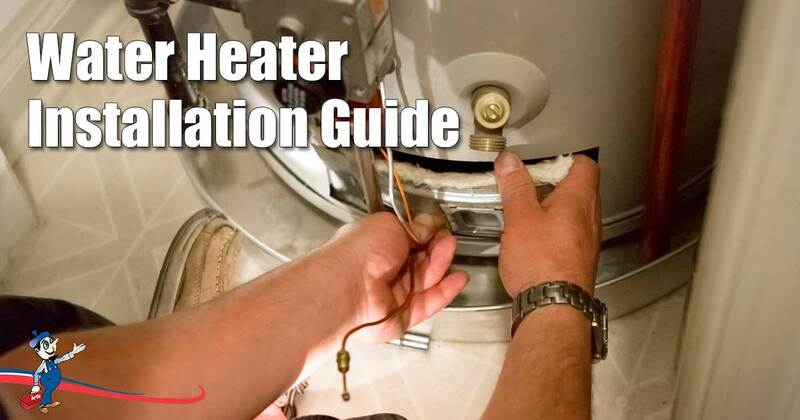 How Do You Install a Water Heater? When it comes to water heater installation, it’ll involve working with natural gas or electricity – each carry a safety warning especially if you’re inexperienced. In order to guarantee that the job is done safely and correctly, it’s best to call a professional plumber. Experience and skills mean that you’re getting the job done right, which helps to ensure that your water heater lasts as long as possible- they can have a lifespan of between 10-20 years, depending on various factors. They’ll also be able to tell you if you need a permit from your local city, as building codes vary by city and will be responsible for all the right materials and tools you’ll need. Water heaters come in two types: tank or tankless. They both achieve the same purpose – heating up your water – but accomplish this in different ways. A tank style heater stores a specific amount of water, keeping it heated at the temperature you choose, sending it along when you turn on the hot water faucet. A tankless system on the other hand doesn’t store water, but rather heats it only when you need it. It does this through a design of super-heated coils. Each type of water heater has their own advantages and disadvantages. The difference between the two is how the water is heated – either through natural gas or electrical resistance coils. Electric water heaters tend to be more energy-efficient than gas water heaters, but the cost of electricity can make the electric the more expensive choice. A gas water heater can be used even during power outages, and are usually more ideal for a large family, as they have a fast recovery time. Another option is a solar water heater, which can help increase the hot water available, but these tend to be very expensive. A professional will also be able to advise you on what type and size of water heater you should get, based on your needs, family size, and budget. This way you can be sure that everything has been done safely and to code, and that you’re getting the best service for your needs. Call 1-800-475-1504 now for more information about water heater installation.